my birthday was a little over a month ago, but since a number of… - when it's all over we still have to clear up..
my birthday was a little over a month ago, but since a number of people asked what i got, i thought i might as well do a little post about it here. this is not the complete list, only a few items..
saskia gave me a teddy bear & other things, including something else for umm.. in the bedroom (not pictured here)..
from my parents a dvd box of the heimat trilogy. from henk i received the book cloud atlas by david mitchell. a very generous amazon gift certificate from marjolijn. rich (relevant on twitter) sent me a dvd of the almodovar film volver. saskia saw this teddy bear in a shop window & she absolutely had to get it for me. that was about a week before christmas & she managed to keep it hidden from me for weeks. 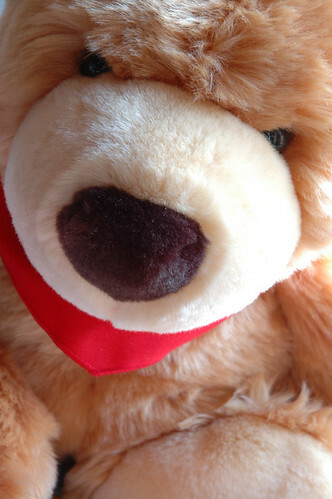 I love the stuffling bear. I look for the name of film of your hero Geert Wilders, but cannot find it. Please help me if you know this name. geert wilders my hero? that really couldn't be further from the truth. i don't know who you are, but apparently you don't know me very well. wilders is in the process of negotiation with tv stations about broadcasting his film. if that fails, he's planning to put it on the internet. he might do that anyway. the film is named fitna.